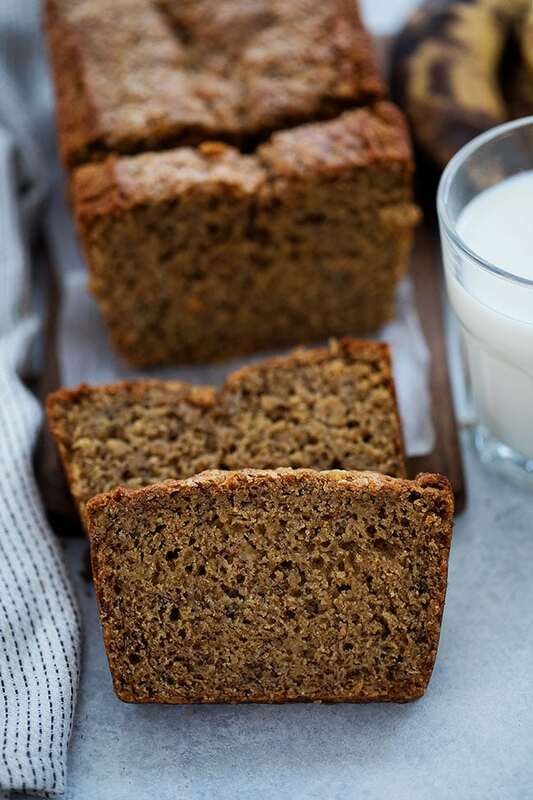 This Healthy Banana Bread recipe is made with whole wheat flour, bananas, coconut oil, Greek yogurt, and naturally sweetened with pure maple syrup. It is a family favorite! I love baking banana bread and our boys love eating banana bread, we are a great team:) The other day they spotted brown bananas on the counter and begged me to make a loaf of banana bread. They didn’t have to beg too hard because I was in the mood for banana bread too, I always am! I decided to make a few changes to our favorite banana bread recipe to make it a little healthier. I was a little worried the banana bread wouldn’t be as good, but guess what? It is super delicious! The boys LOVED it and had no idea it was healthy banana bread. I consider that a winning banana bread recipe FOR SURE! Bananas-Of course, you need bananas to make banana bread, but make sure your bananas are BROWN and overripe. 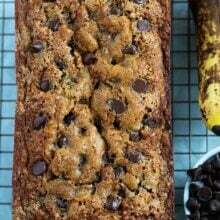 Brown bananas will make the banana bread extra sweet and moist. 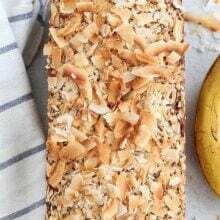 Coconut Oil-There is no butter in this banana bread recipe. I use 1/3 cup of melted and slightly cooled coconut oil. I measure the coconut oil first and then melt in the microwave. Let it cool for a few minutes before adding it into the mixture. If you don’t have coconut oil, you can use vegetable oil or grapeseed oil. Greek Yogurt-I add plain Greek yogurt to add protein to the banana bread and to keep it super moist. 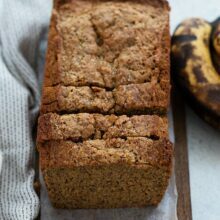 Pure Maple Syrup or Honey-This banana bread is naturally sweetened with pure maple syrup or honey. I have tried both and both are delicious! I also cut back on the amount of sugar in the recipe. There is only 1/2 cup for the entire love and the banana bread is plenty sweet. If you need the banana bread to be gluten-free, use all-purpose gluten-free flour. I like Cup4Cup and Bob’s Red Mill. If you need the banana bread to be vegan, you can use a flax egg instead of the regular egg, replace the Greek yogurt with unsweetened vanilla almond milk, and use pure maple syrup to sweeten the bread, not honey. I use a 8.5 x 4.5-inch loaf pan for this banana bread recipe. 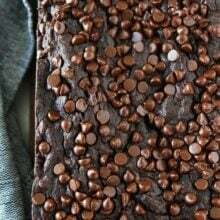 If you have a 9 x 5-inch loaf pan, you can use it, your loaf will just be a little shorter and you will need to reduce the baking time a little. Oven times vary so make sure you check the banana bread around 45 to 50 minutes. My banana bread takes 55 to 60 minutes. Time will depend on your oven. The bread is done when a toothpick inserted into the center comes out clean. Let the banana bread cool in the pan for 10 minutes. Loosen around the sides and edges with a knife and carefully remove the bread from the pan. Cool on a cooling rack before slicing. 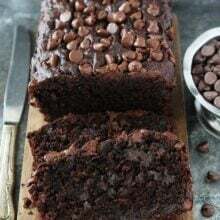 The banana bread is best the day it is made, who doesn’t love a warm piece of banana bread? It will keep on the counter for up to 2 days. It is a moist banana bread and will moisten even more as it sits. I like to lightly cover it with plastic wrap so it doesn’t get too moist. You can wrap it in plastic wrap and keep it in the refrigerator for up to 4 days. You can freeze the banana bread for up to 2 months. Defrost before slicing and serving. You can also freeze individual slices of banana bread. Pop them in the toaster for a healthy breakfast or snack! 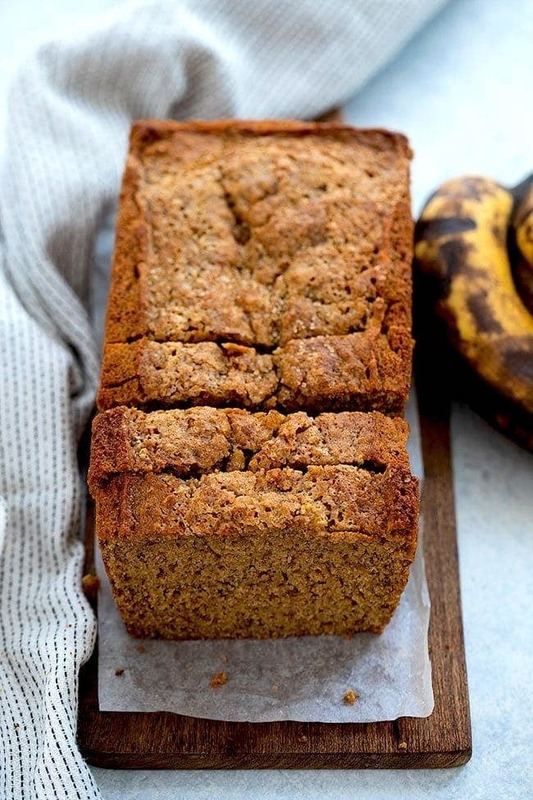 The next time you have a bunch of brown bananas, give our Healthy Banana Bread a try! We LOVE it and I promise you won’t even know it is healthy because it is so delicious! Enjoy! This lightened up healthy banana bread is a family favorite! Heat your oven to 350°F. Grease a loaf pan with nonstick cooking spray and set aside. In a medium bowl, whisk together the flour, baking soda, salt, and cinnamon. Set aside. In a large bowl, mash the ripe bananas with a fork. Add the melted coconut oil and stir until combined. Stir in the maple syrup or honey, Greek yogurt, egg, and vanilla extract. Stir until smooth. Stir the dry ingredients into the wet ingredients, don’t over mix. If you over mix the bread will flatten and end up heavy. Pour batter into prepared pan. Sprinkle with turbinado sugar, if using. Bake for 50-65 minutes, or until a toothpick inserted into the center of the bread comes out clean. Check the bread at 50 minutes, just to be safe. Oven times vary. Remove the pan from the oven and set on a wire cooling rack. Let the bread cool in the pan for 10 minutes. Run a knife around the edges of the bread and carefully remove from the pan. Let the bread cool on the wire cooling rack until slightly warm. Cut into slices and serve. I have had a question about coconut oil for quite awhile but have never asked. What I s the difference between the solid and liquid coconut oil? Can the liquid be subbed for the solid that’s melted and then cooled? Thanks for your help and as always, a very yummy looking recipe which I intend to make. You can melt the coconut oil. Perfect! I saw this post last night as I was planning to make banana bread in the morning. I was going to use my mom’s recipe but wanted something a little healthier for my one year old. Turned out great! I did turn the oven down to 325 with about 20 min left so it didn’t get too brown. 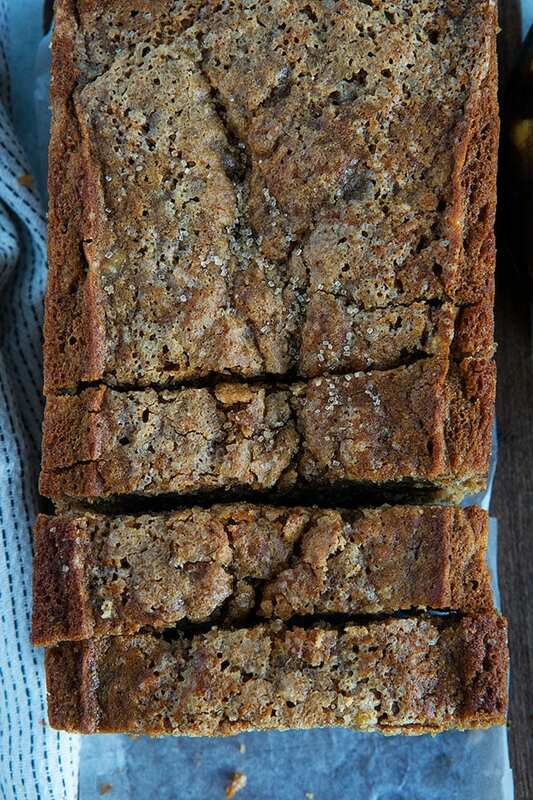 I’m *always* down for a slice of banana bread goodness! I made mini loaves of this bread and added walnuts and chia seeds .I toasted it and topped it with Teddies peanut butter. It’s now my favorite recipe!! Can you please explain the nutrition facts? It says a serving size is 12 g, which I took to be 12 grams. That would weigh more than a single bite of banana bread. Do you mean the g to mean something else? We love healthier recipes for our sweet treats so this was perfect for us and the aging bananas in the fridge. It was easy and delicious! Thank you, Maria! Cooked it over 55mins, really easy. I used 7 bananas, medium size, no sugar but rice flour instead. Can I swap for coconut flour? Or oat flour? If so how much? Same amount? I really liked this. I did have to use 1/2 a cup of quick oats because I only had 1 cup of flour. I used 4 medium bananas which made 1 and 1/2 cups of crushed banana and I put it all in. No sugar on top, but my husband liked it as well. Thanks for sharing. I give it 5 stars, but for some reason it won’t let me click on them. Glad you loved the banana bread!